Pleasure is something we are told the French are very good at in the numerous publications out there intended for English-speaking audiences explaining how and why the French do things better than us. Recently, the idea touted in one such article grabbed my attention. Pleasure is good: How French children acquire a taste for life, defines the process of the “education of taste” which French children with loving parents are lucky enough to undergo. This education teaches children how to eat properly at the table while imparting an appreciation for a variety of foods and flavors. While the education of taste directly influences a child’s eating habits, it’s also meant to awaken all of the child’s senses and ultimately lead to an enriched life full of pleasure. I love that concept. 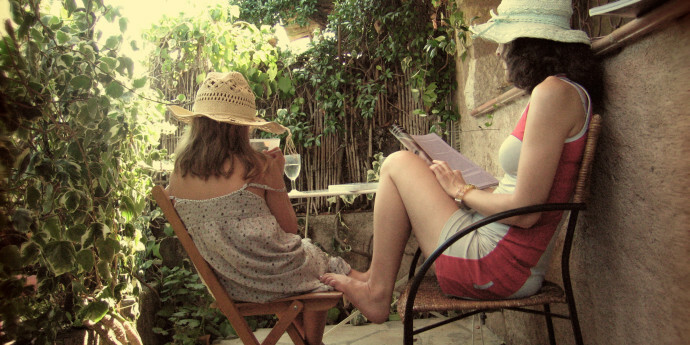 Having no personal insight into French parenting techniques, I must take Marie-Anne Suizzo’s, the article’s author, word that the education process is as idyllic and effective as it sounds. I have, however, seen French supermarkets filled to the brim with processed convenience foods and I’ve seen very busy McDonald’s scattered throughout Paris…it’s not just tourists enjoying Big Macs and milkshakes. Don’t think for a moment French parents are raising a nation of perfect little eaters with refined, sensitive palettes who will only consider swallowing a morsel if it’s handmade and bears an artisan history. But, I have also experienced the multi course school lunches to which the author refers. In France, lunch does not take place before noon nor does it last less than an hour. Unlike so many schools in the U.S., where lunch for some reason is creeping closer and closer to breakfast time, French faculty and students are given the time to sit down and have a proper meal. This meal could consist of lentils, roasted meats, braised leeks and fresh fruit, or it could be hamburgers and fries, depending on the day. I can only see benefits from cultivating a mindset where life is dotted with pleasures great and small (happier people) and good food is appreciated and savored (greater satisfaction and a reduced temptation to overeat, a rise in demand for quality food…eventually leading to a better food system). So my question is, how will you let food enrich your life and bring you pleasure today?